We just got back from a little vacation to Oahu and I thought I would share the highs and lows of our trip in case you are also planning a visit. This was our third trip to Hawaii and first to the island of Oahu and it did not disappoint. We had some delicious food, spent a lot of time exploring and really enjoyed our vacation. I did read a bunch of articles and tips for travel to Oahu before leaving and you will find many of the same spots are mentioned over and over again. We did try a lot of the more popular places and deviated a bit to do our own thing too. 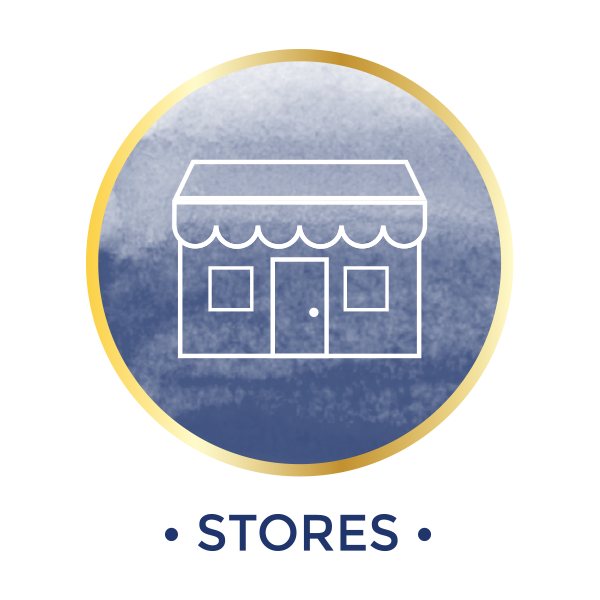 Typically on vacation my husband and I love to explore new restaurants, local favorites and we always splurge a bit on great, local foods. Wicked Hi Slush– hands down this was our very favorite food item of the trip. We stumbled upon the little cart in a Farmer’s Market in Waimea Valley. These are slushes that are made with fresh fruit and no added sugar- just honey. I was very skeptical but my little girl loves honey so we tried the Pina Colada flavor with pineapple, coconut milk and honey and it was as delicious as it was beautiful! Hunt this little cart down if you find yourself in Oahu. It is so worth it. Shaved Ice- Of course we had our share of shaved ice. 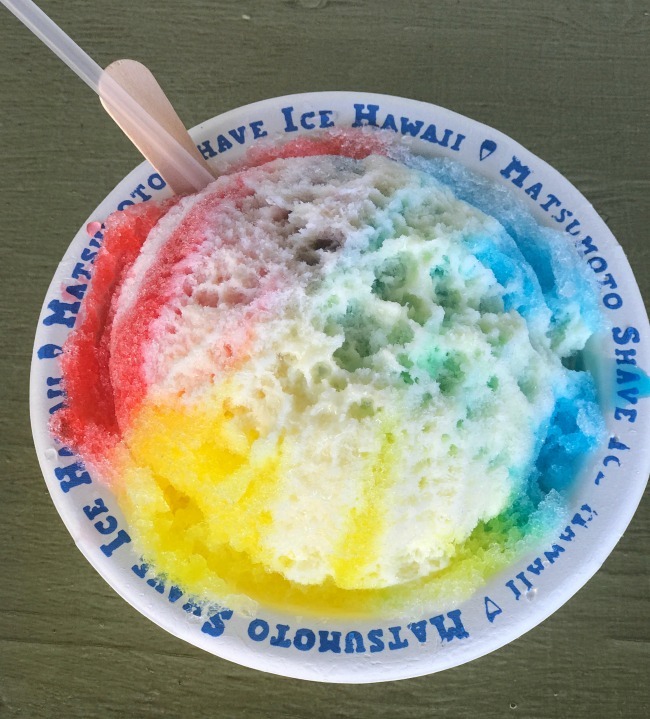 We had to try Matsumotos Shaved Ice on the North Shore which is all you hear about when it comes to shaved ice. The place had a line a mile long and we did enjoy it. I tried it with condensed milk on top which gives your shaved ice an ice cream-y flavor. This is going to be controversial but we thought Matsumotos was just OK. In Maui we had shaved ice with real fruit purees and it was so much tastier (in my opinion) but for sure Matsumotos is worth trying. The next day we tried another Shaved Ice place right across the street (zero line) and all five of us agreed it was pretty comparable to the one we had the day before at Matsumotos. *NOTE: Parking. The parking can be an issue on this popular strip of the North Shore. Please be sure to check and triple check you are parking in a legal spot. Apparently the owner of a tow truck company lives right across the street from Matsumoto and spends his day watching for tourists to park illegally and immediately sends a driver over to tow vehicles. Yup. We were gone less than 20 minutes and got towed- the signage was partially obscured and difficult to see. $150 tow truck fee and $25 Uber ride and 90 minutes later we were on our way. As we sat in a parking lot waiting for my husband to return with the car, we watched numerous other cars get towed. Quite the enterprise they have going so please take care. Dole Whip- Yup. You just can’t go to Oahu without trying a Dole Whip. 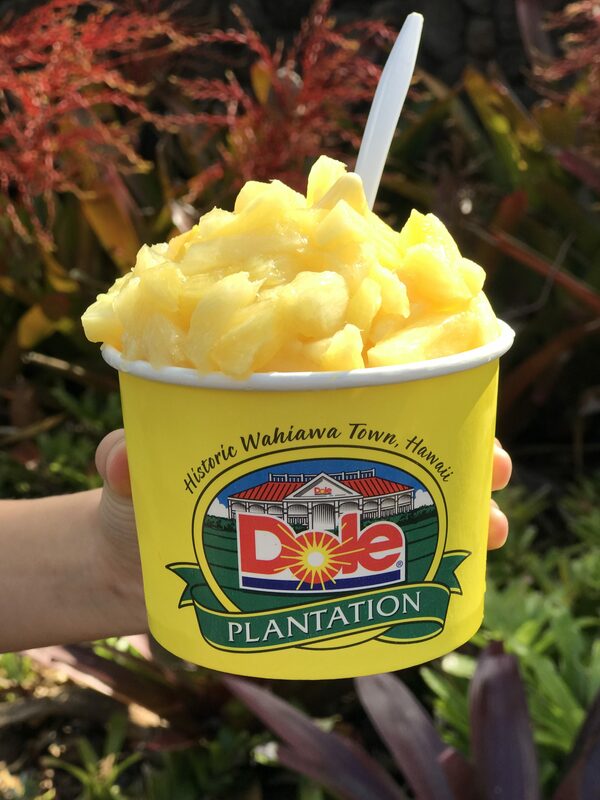 It is worth the trip to the Dole Plantation I promise. We went twice and enjoyed every last bite. The Dole Plantation also has a grill with several menu options and a really fun tent out front that serves a variety of flavored grilled corn on the cob. We had a light lunch of corn on the cob and then the Dole Whip after and it was perfect. Can’t wait to try a corn on the cob bar for summer parties this year! Malasadas- Yes this is a Portuguese treat but Leonard’s Bakery is a super, super popular spot in Oahu to get these heavenly little balls of fried dough and they were so good we actually went twice during our trip. 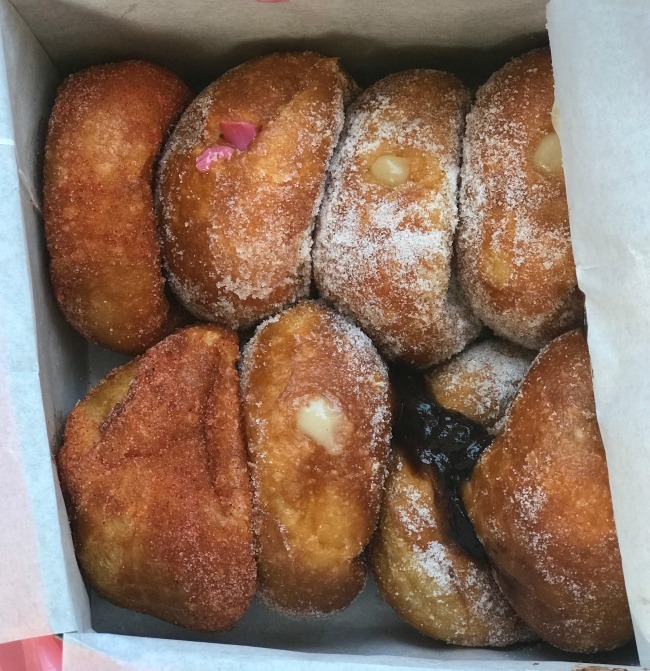 A malasada is a cross between a beignet and a doughnut and you can get them plain (coated in sugar, cinnamon sugar or Li Hing. 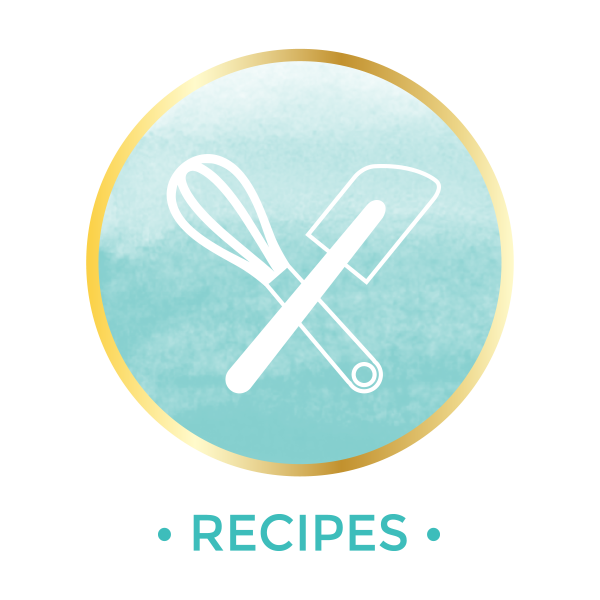 (Li Hing is a sweet and sour flavoring that is popular in foods and drinks in Hawaii and hard to describe.) You can also get the puffs version which is stuffed with a pudding-like filling.) Just get one of each is my recommendation because they are all so darn good. We all had different flavors that were favorites- one vote for chocolate filled, one vote for plain sugar, one vote for cinnamon and one vote for custard. I abstain from voting because honestly I want a bite of every darn one. 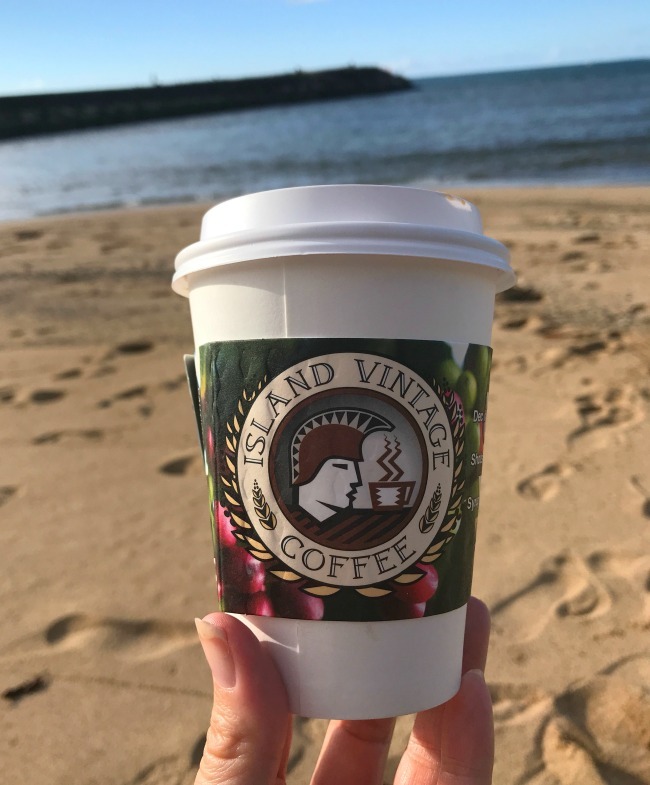 Island Coffee. This was recommended by friends and is wonderful. I am a plain coffee, splash of milk kind of girl but I branched out and tried the Hawaiian Honey Latte. It was wonderful! Not too sweet. Typically when we travel we stay at resorts and hotels but with Grandpa on the trip this time, we wanted to cut costs and rented a townhome instead. I don’t have a specific hotel to recommend but I thought I’d mention our take on the various sections of the island so you can decide what might work best for your trip. 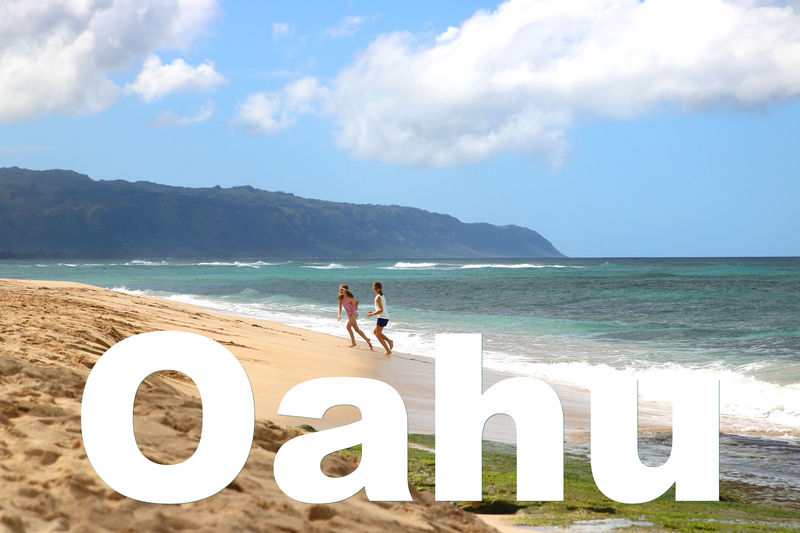 North: this is the famous North Shore and home to the adorable little town of Haleiwa. West: this is where we stayed in Ko Olina. There are several large resorts in this area including Four Seasons, Marriott, and Aulani. Central: Dole Plantation is located in this area. East: The East is where is world famous Lanikai beach is located as well as Kualoa Ranch and the Secret Beach. We travelled all over the island and we were very happy with the West side where we actually stayed. Ko Olina is a more suburban area with some amazing lagoons and is a great spot for a relaxed and quiet vacation. If you want to be in the heart of the restaurants and hustle and bustle, Honululu might be a better choice. The drawback to the West is that we did find we spent more time in the car than we would have liked and you do miss some really cool stuff like fireworks on the beach (Fridays in Honululu) and we had far fewer restaurant choices/ shopping etc… The positive is that it was very peaceful and pristine and we loved the lagoons (more on those later). If you do stay in Honululu be prepared for a ton of people and heavy traffic. Lanikai Beach. This beach is as gorgeous as you hear. It is consistently rated one of the top beaches in the world and the sand is incredibly soft- like sugar. The water is so beautiful in various shades of blue and calm enough for little ones to play. We went on a weekend and it was fairly crowded and parking was a nightmare- Lanikai is right smack in the middle of a huge residential neighborhood. Guessing a weekday would have been a better option. Grab snacks and drinks at Kalapawai Market on your way to the beach. Dole Plantation. Obviously you have to stop here for a Dole Whip or two or four. (No judgment here friends). You can also tour the gardens, do some souvenir shopping, take a train ride out to see the various fruits grown on the plantation and get an audio narration all about James Dole. Last you can make your way through a pineapple maze. Honestly I didn’t think this was super fun. The train ride was OK but not super pretty and the maze wasn’t that special either. I asked my kids what they thought and my older daughter thought the maze was one of the highlights of the trip- we had a race with her and Daddy v. the little sister and Mommy to get through the maze and they just barely beat us so I guess that may have been why. Polynesian Cultural Center. So this is a really neat spot. 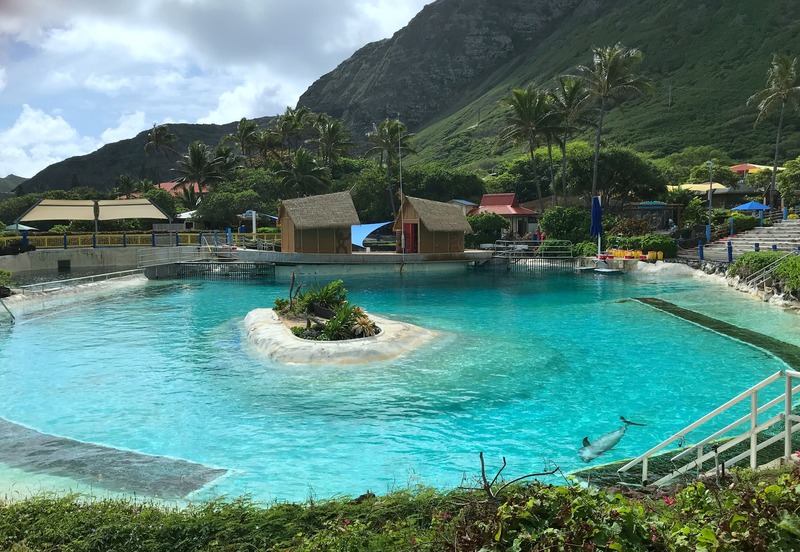 It is a huge area that you can walk around and it showcases some of the amazing things the Polynesian Islands have to offer such as Hula lessons, fishing lessons, how to play a Ukulele and so much more. It is absolutely stunning to walk around and is a pretty popular attraction. Unfortunately the day we chose to visit it was 101 degrees and as the center doesn’t open until 12pm, we were just blazing hot and miserable. We didn’t stay as long as we would have liked. 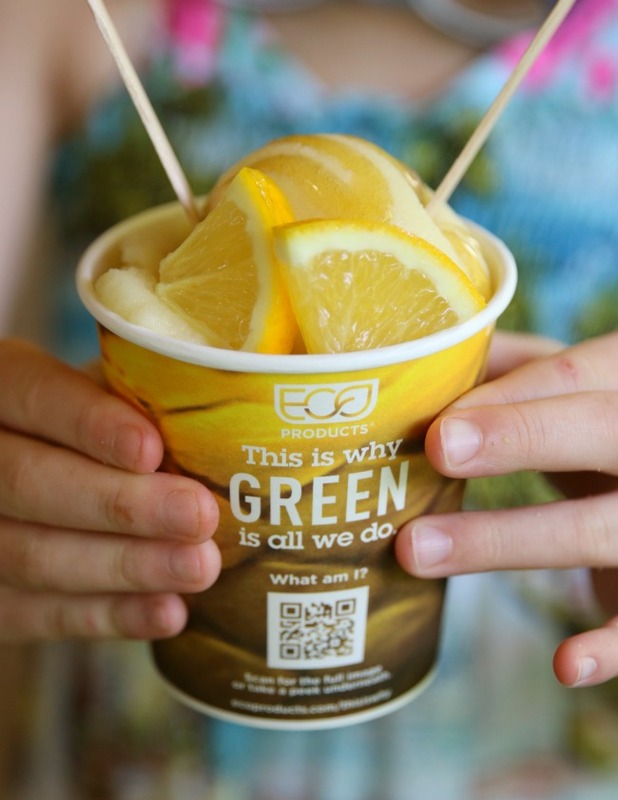 Choose a cooler day and this would be really fun for the entire family. 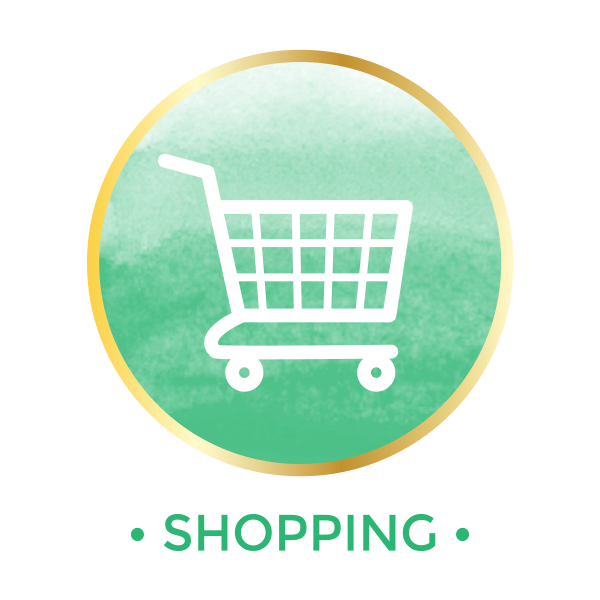 PS: You will also find lots of souvenir shopping here, evening shows and a luau. Swings on the Beach. If you do go to the cultural center, we discovered a series of three fun swings on the beach right down the street. The kids had so much fun on these swings and it was a great way to burn a little energy. These are on the beach so I don’t have an exact address for you but the best and largest swing was almost directly across the street from a Church of Jesus Christ of Latter-day Saints. If you put this address in your GPS: 53-958 Kamehameha Hwy, Hauula, HI 96717 and then look directly across the street you will see it. Two more swings you can see from the highway between that church and the Polynesian Cultural Center. My kids LOVED these. Snorkeling. There are tons of spots but we choose one of the more popular ones, Hanauma Bay. This was a pretty spot but that day my allergies were killing me and I kicked it on the beach waiting for the family. My husband had to stay close to shore because of our 8 year old so they didn’t see as much variation of sea life as they had hoped. So we wouldn’t say this was amazing snorkeling but I suspect if I had felt better and we had gone out further, it would have been much more fun. Wet n Wild. Normally I would never go to a place like this on vacation because you can find water parks in basically any city. But considering we missed out on a hotel pool and we had a free pass (See Go Oahu note below), we popped in here literally one hour before closing on a Sunday just to see. What a great experience it wound up being! It was a hot day and a weekend but the park was virtually empty. 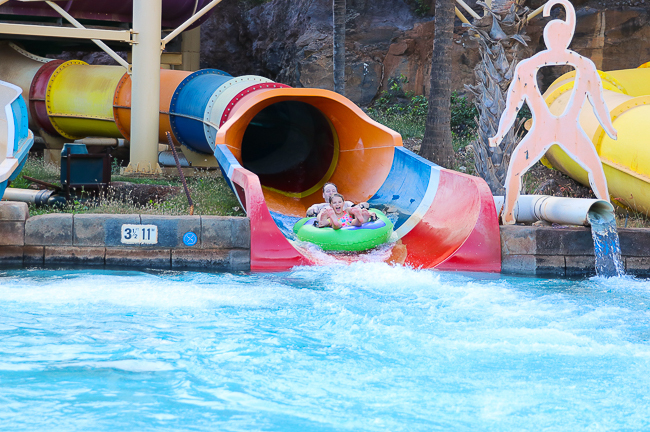 In just 60 minutes my children went on 13 different waterslides- not just boring water slides but the big, you need a raft water slides plus spent time in the wave pool. At our local water park the lines are typically 15-30 minutes long per ride but at Wet n Wild they barely waited at all. This is probably due to the time of year (January) but still worth noting. Diamond Head hike. 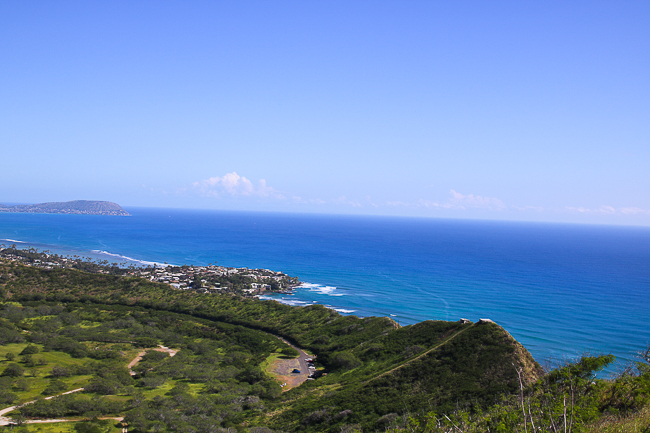 You can hike to the top of Diamond Head and see lovely views of the ocean and a crater that is over 300,000 years old. We read this was a short and easy hike and I have to tell you that was not our experience at all. We did go on a warmer day and had to leave Grandpa behind as it is fairly steep and an uneven walkway. Plus there are ten trillion tiny stairs once you think you hit the top. I was sweating and found the hike to be fairly strenuous and we are frequent hikers. Bring water and I suggest hiking in the morning or a cool afternoon if you can. Sea Life Waterpark. My #1 requested activity for the trip was swimming with dolphins. We were very excited to do this at Sea Life and wound up selecting the Dolphin Encounter which allows you to “play, kiss and dance” with dolphins. This was a fun experience- basically we lined up in a group of 10 people and had a trainer show us how to kiss a dolphin (quick smile for photo! ), have the dolphin kiss our cheek (quick smile for photo!) and give us a high five (quick smile for photo!). It was a neat experience but we really didn’t get much time or interaction with the dolphins at all- it was more just a few seconds per person- long enough to snap the photo and done. I was excited to see the photos and expected they might be pricey but we were really shocked to discover a handful of pictures of our family was a whopping $150. After paying $140 per person for the experience. That was very disappointing and if I had to do it again, I would have paid for the upgraded dolphin packages and we would have staggered family members at different times and just taken our own photos from outside the pool area. The photographers only capture that one tiny second with the dolphin anyway and not the many other sweet moments you might have while in the pool. Also, see the Albertsons Weekly Ad. Ko Olina Lagoons. We stayed in Ko Onlina and I am so glad. The lagoons wound up being a major highlight of the trip. There are four lagoons and please note this is a residential area with a few major hotels sprinkled along the coast and one stunning golf course. Parking is a major issue here for the lagoons. There are a few tiny lots with first come, first serve parking. You drive up to the parking lot where you find a bar closing the lot off and literally sit and wait for a car to leave and then you drive in as they come out and you can park for free. The lagoons were walking distance from our Air BnB and we also had Grandpa drop us off and pick us up a few times. So much easier than trying to find a parking spot in one of those tiny lots. These lagoons are stunning and the sand is soft and silky. The water such a beautiful blue and clear enough to snorkel. Nice calm water so we literally bought floaties and floated around for hours and hours. Incredibly relaxing. The lagoons have Aulani hotel, Four Seasons and Marriott hotels right in front and part of the beaches will be marked off for hotel guests. Fine with us though as the public sections of the beach were nearly deserted and the hotel sections were packed. You can visit Island Market on your way in for snacks and floaties (our inner tubes pictured above were only $3.99 plus $.50 to have them blown up!) And yup guess who is just floating along happy as can be above? This girl! There are tons of grassy patches to enjoy dinner and you will find some of the most beautiful little spots to take family photos. Oh and on the way out, we found the little pizza place Pizza Corner to be quite good or for something nicer try the Monkeypod. This entire area was charming but watch for huge waves and waves of crowds that come from the Aulani right across the street. Waimea Falls. This was an easy hike along stunning, lush gardens and ends at a pretty little waterfall. The water was cold but you can jump in and go straight to the waterfall. We went in the mid morning and saw barely any other hikers but as we were leaving in the early afternoon, it was getting quite busy. If you go on a Thursday there is a fun Farmer’s Market before you enter the falls. Kayaking/Paddleboarding. 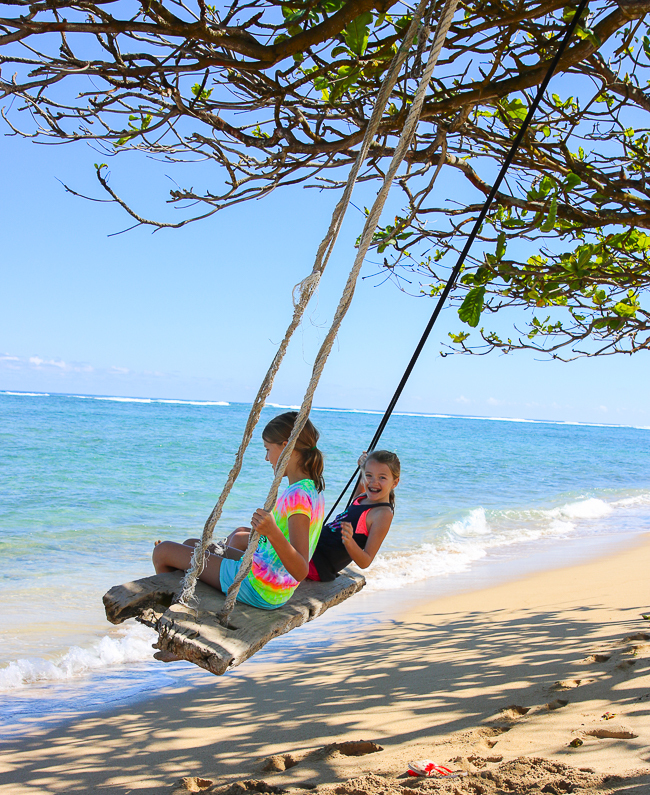 We did this as part of our Go Oahu package and it was on the beach in Haleiwa. This was fun and very picturesque. You have the beautiful ocean on one side with surfers and sailboats and then turn a corner for a super calm and beautiful river, surrounded by lush greenery. We loved this experience. 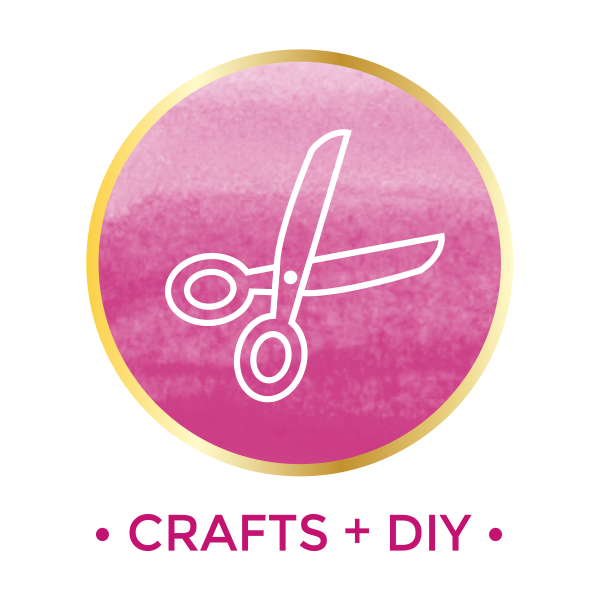 Last but not least a little note about the cost. This was not a sponsored trip and we did pay for everything ourselves. We decided to purchase a Go Oahu pass to save a little money. 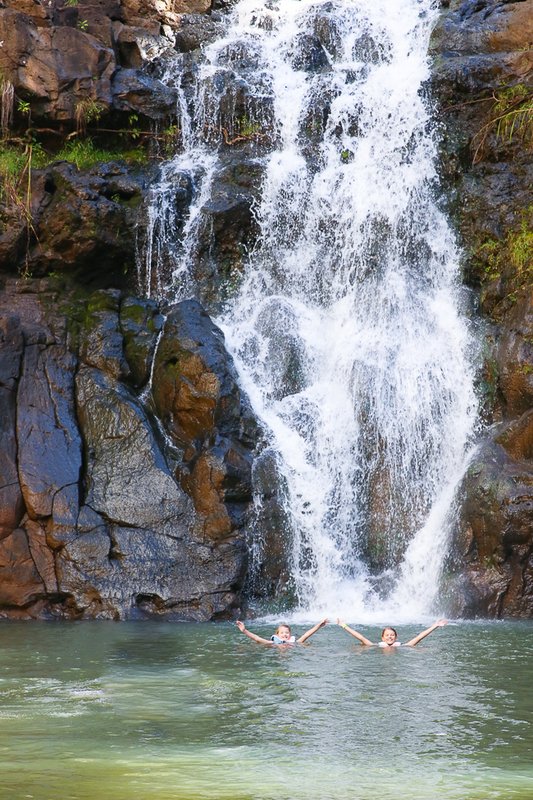 The Go Oahu pass allows you to do as many activities as you want within a 3, 4 or 6 day window. You choose from 34 activities in total and that was how we paid for the Wet n Wild, Sea Life, Snorkeling, Kayaking/Paddleboarding, Cultural Center and Waimea Falls hike. A few little notes about what we would change or do differently. I mentioned a few things above but we really would have liked to Kualoa Ranch. This is part of the Go Oahu program and we planned to do a tour and spend an afternoon at the Secret Beach but we saved it for our last day and by then we were just completely exhausted and tired of driving in Oahu traffic. I am sorry we missed this experience. Sightseeing in Honululu. 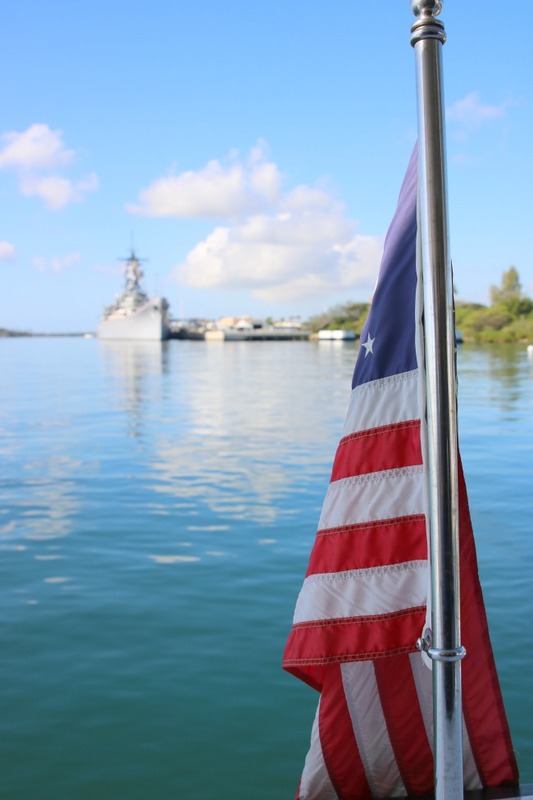 We went to Pearl Harbor in the morning and spent the afternoon in Honululu. 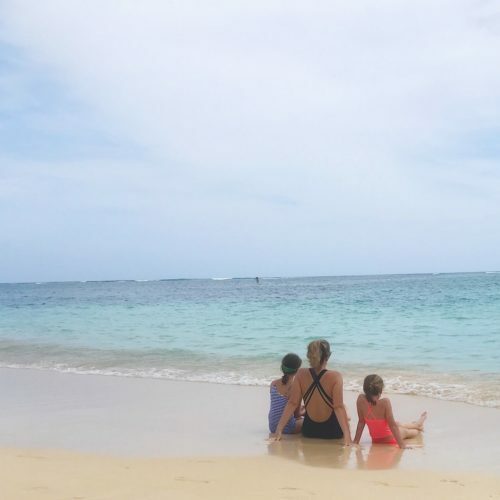 I wanted to see the wall murals in Honululu and visit the Royal Hawaiian Hotel and the Surfrider Hotel (Instagrammers dream locations) and we would have loved to do more shopping and eating and especially to see the fireworks on the beach from the Hilton. There just wasn’t enough time and we were not in the mood to deal with the heat and the crowds and the traffic. I think we should have set aside a day for just Honululu and started early when everyone was fresh and happy. All in all it was a great trip and we loved the beauty and diversity of Oahu. We did quite a bit but there is so much more to do and see! 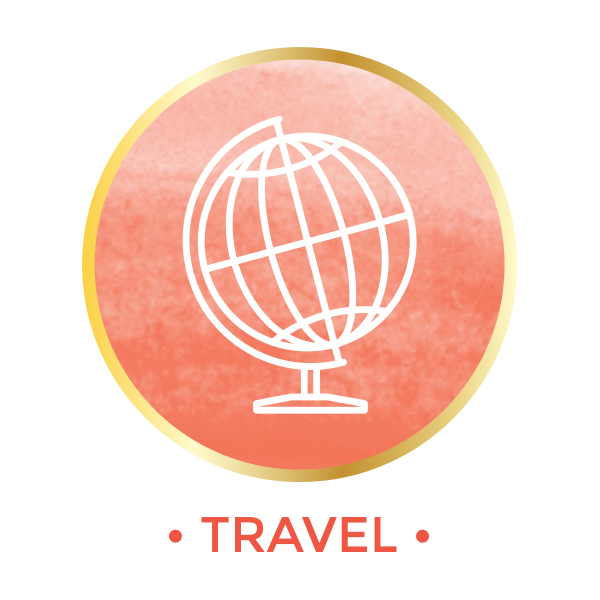 I hope this is helpful for planning your own fabulous vacation- I would love to hear your feedback if you have also visited the Island. It would be great to get a perspective from different times of year in particular. 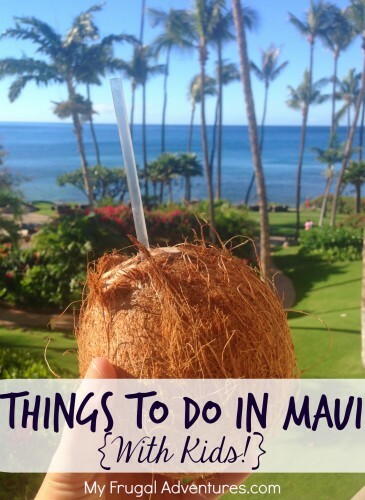 Visiting Maui? Here is an article to check out. May I ask what time of the year did y’all vacation to Oahu? We are traveling there staying at Aulani at the end of this May and was wondering what kind of heat to expect. Thanks in advance. Oh wonderful! We went in January. I bet the weather is gorgeous in May but I wonder if that is the rainy season? Even on rainy days you will have lots to do at Aulani. I hope you have a wonderful trip. 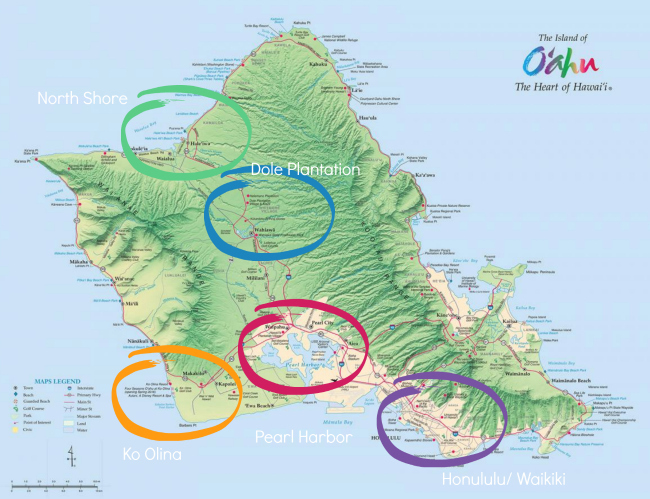 Oahu looks like lots of wonderful things to offer for visitors! Hope to travel to Hawaii one day and we’ll definitely visit Oahu! Hi, I loved reading your blog and found it very interesting as I’m planning a trip to Oahu in April 2020. I have looked at various places to stay, wondering which is a good location away from the hustle and bustle of Waikiki. Im thinking of staying on the east coast for 6 nights, then planned on staying at the Marriott Ko Olina for 3 nights. You have mentioned a few of the attractions that we want to do too also, but wondered what time of day you would have to get to Honolulu to miss the traffic and spend the day. I know you said you didn’t do this on this trip ( maybe next time) . In your opinion if we stayed on the Windward coast, would it be a doable spot to see most of the sights you visited? Any advice would be most appreciated as I’ve never been to Hawaii. Lynne- don’t worry at all, you are going to have such a wonderful time! Oahu is gorgeous and no matter where you go, it will be amazing. I really couldn’t say about Honolulu and missing traffic etc… Its like asking when to go to LA to avoid traffic. I think you just get into the mindset that it will be busy if that makes sense. Thanks for the tips Charlene, and I will certainly check out blog suggested!